Welcome to Laganland SWEDEN SHOP ! This is the best-furnished shop of elk souvenirs in Sweden. We offer nearly all elk connected products available on the market. A constantly renewed variety of goods is always maintained. 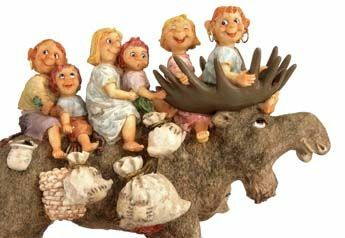 Laganland Sweden shop also provides a diversity of Sweden souvenirs, for example: trolls, brownies, Vikings, Dala horses and so on. And most definitely, glass and ceramics from the famous glass district of Småland. These are always very cherished presents. 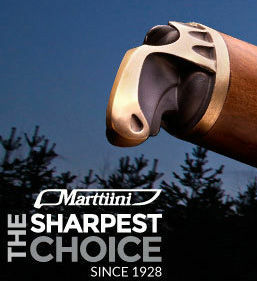 But upon visiting us you will see that the elk is our speciality. Welcome to a unique shopping experience! Laganland Sweden shop sells all kinds of elk souvenirs. 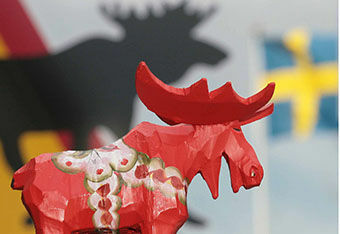 For example hand-crafted elk figures of Swedish design. You will definitely find your own favourite here. 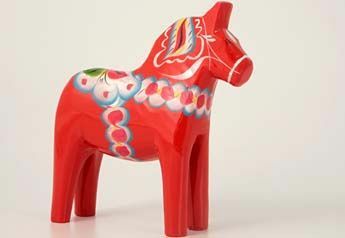 The Dala horse has long been a well-known Swedish symbol. Thus, tourists stop at Laganland to enjoy our display of this beautifully hand-painted horse. 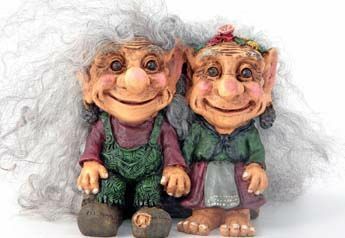 Brownies, gnomes and trolls. Mythical creatures from Swedish tales and sagas. In these tales the trolls are said to live among the elks! You will find a large variety in our shop. The area surrounding Laganland is rich in ancient remains from for example the Viking Age. 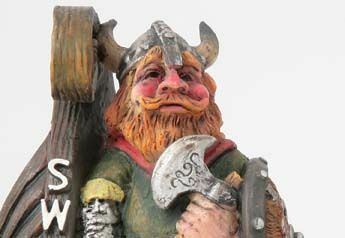 We offer you a historic assortment of Viking-souvenirs. We carry a large collection of exclusive products of elk leather. Wallets, purses, caps, belts, key cases, pocket-flasks, rucksacks, briefcases and so on. Step into our shop and feel the softness of elk leather in quality products from Småland. We are open all year around! Other dates Mon-Fri 10-16 and lim. opening hours during weekends. Larger groups and busses are very welcome and we have a large parking area. We accept Nordic currency, Euro and US$ at good exchange rates. We provide Sweden products as well as elk products also for companies. The ideal shop for tourists in Sweden! Authentic road signs with elks! Since 1992 we sell auhthentic road signs with elks! 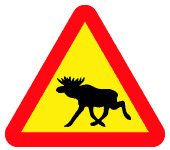 Laganland was the first shop in Sweden to sell these elk signs. Above all to German tourists. During the years Laganland Sweden shop and the tourists’ interest in the elk has attracted some attention in media. Television as well as radio and newspapers.